Hey guys! Yes, we're still on an irregular posting schedule because I'm not feeling so great. Ah well, it happens! Today, we have Different Dimension Drops of Jupiter! 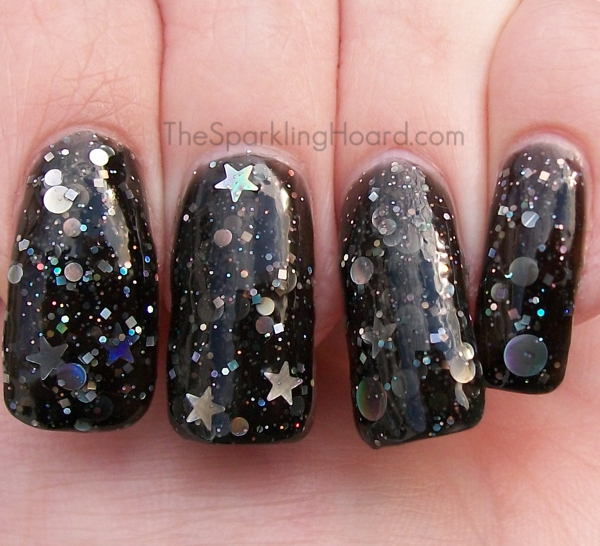 Drops of Jupiter features a black jelly base filled with a mix of silver holographic glitter (stars, circles, hexagons, and squares). It's on the sheer side, so you'll likely need to use at least three coats, like I did. The formula was surprisingly thin and the polish flowed nicely, though you may want to shake it, leave it upside down for a bit, and give it a shake between coats to ensure that the larger glitters are easily accessible. The stars and the largest circles can be a bit hard to grab, but you don't really need to do any crazy fishing for them. As with all chunky glitter mixes, you'll probably want to use a thick top coat, or a layer of Glitter Food/Gelous plus top coat to smooth things out. Dry time was average. Inside, by the window. Not the best photo, but it shows the pretty flashes of color made by the holographic glitter! How does it compare to Emily de Molly's Dark Forces? 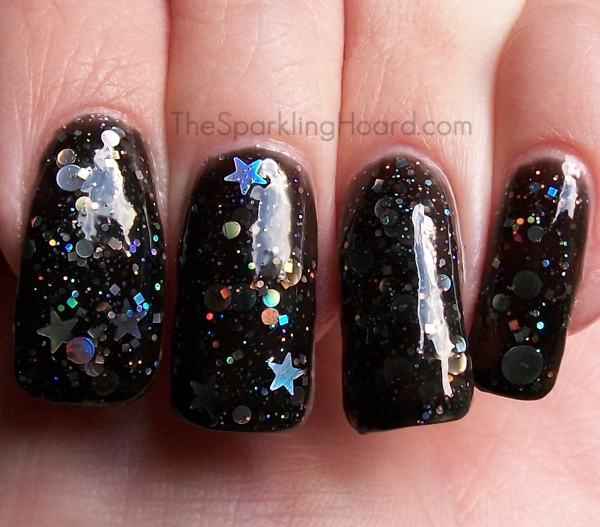 The main difference is that Drops of Jupiter has star glitter and Dark Forces does not. 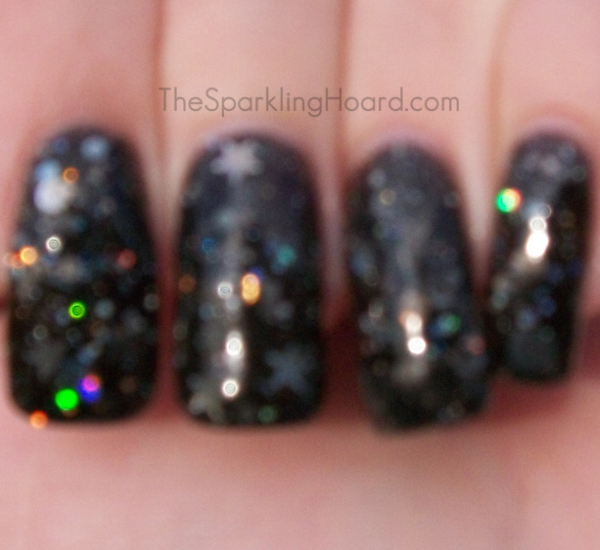 The glitter mixes differ in other ways as well, with Dark Forces having just hexes and large circles, while Drops of Jupiter has 3 sizes of circle glitter, square glitter, and hex glitter. Additionally, Dark Forces has a darker, blacker base than Drops of Jupiter. They're really more different than I thought they'd be! Click to enlarge. Dark Forces on the left, Drops of Jupiter on the right. Different Dimension polishes cost $8.50-$11 for 15mL. They can be purchased on Etsy, Llarowe, MeiMei's Signatures, Edgy Polish, and Ledouxnuage. To stay up-to-date on the latest news from Different Dimension, follow the brand on Facebook and Instagram. Nail Art: The MTV Logo+Vote for Taylor!